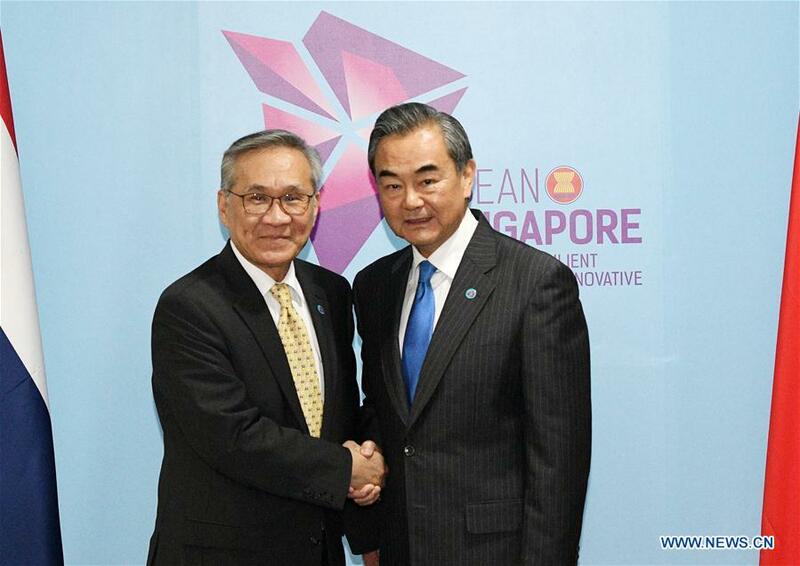 SINGAPORE, Aug. 4 (Xinhua) -- Chinese State Councilor and Foreign Minister Wang Yi met with Thai Foreign Minister Don Pramudwinai and Australian Foreign Minister Julie Bishop Saturday on the sidelines of the Association of Southeast Asian Nations (ASEAN) foreign ministers' meeting and related meetings. While meeting with Thai Minister of Foreign Affairs Don Pramudwinai, Wang said China and Thailand have enjoyed good momentum in the development of bilateral ties this year with fast growth in bilateral trade and investment, Wang said. China is willing to join hands with Thailand to push forward the construction of big projects including the China-Thailand high-speed railway and the Eastern Economic Corridor in Thailand within the framework of China's Belt and Road Initiative. For his part, Do said Thailand hopes to maintain high-level exchanges with China, take part in the China International Import Expo, further enhance economic and trade cooperation with China and continue to press forward the construction of the China-Thailand high-speed railway as well as the cooperation within the framework of the Belt and Road Initiative. When meeting with Australian Foreign Minister Julie Bishop, Wang stressed that China always follows the path of peaceful development and a win-win strategy of opening-up. China has never interfered in the internal affairs of other countries and never carried out the so-called infiltration in other countries. He hoped that the Australian side will meet China halfway, see China's development as an opportunity rather than a threat, and work to enhance mutual trust and cooperation so as to create more favorable conditions for the development of bilateral ties. For her part, Bishop said Australia attaches importance to ties with China and hopes to strengthen communication and enhance mutual understanding and trust with China so as to promote all-round bilateral cooperation. Australia wishes to join hands with China in pushing forward negotiations on the Regional Comprehensive Economic Partnership (RCEP) and the process of regional economic integration. While meeting with Brunei's Second Minister of Foreign Affairs and Trade Dato Paduka Haji Erywan bin Pehin Yusof, Wang said China and Brunei are friendly neighbors and close partners. China and Brunei have been working together to safeguard peace and stability in the South China Sea, and they serve as an example of properly managing disputes and jointly conducting cooperation in the region, Wang said. China stands ready to maintain high-level exchanges and develop greater synergy between the China-proposed Belt and Road Initiative and Brunei's "Vision 2035," expand sectors of cooperation, advance maritime cooperation and help Brunei with economic diversification, he noted. The Brunei's second minister said Brunei and China enjoy sound relations and Brunei hopes to enhance high-level exchange of visits, cement practical cooperation in various fields and maintain close communication on international and regional issues. Brunei is also willing to join hands with China to move forward ASEAN-China relations, the second minister said.